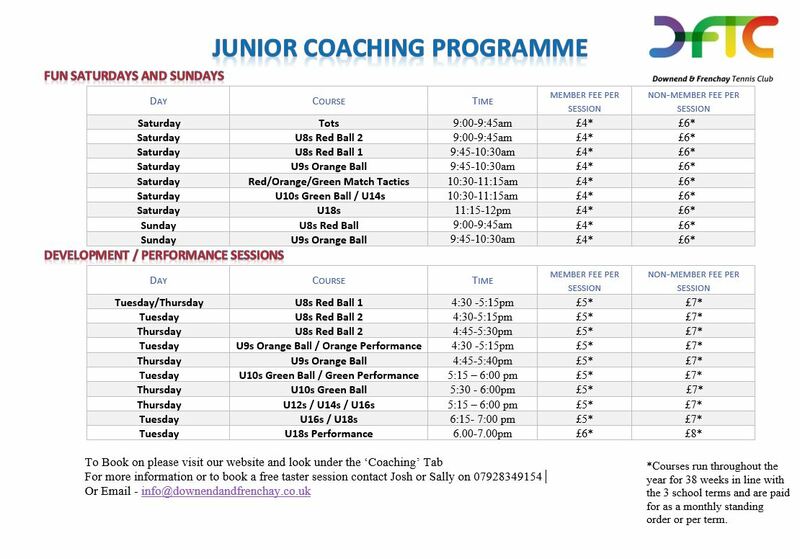 We have a thriving junior programme at Downend & Frenchay TC, please click on one of the links below to view our coaching sessions and book your place or click below to view our Junior Coaching programme. Fun multi-skills session aimed at helping develop the foundations of agility, balance and co-ordination. Fun group session on smaller courts with softer balls. For players just starting out and focuses on the basics. For more advanced players who are ready to focus on rallying and playing points. Fun session on 3/4 length courts with softer balls, teaching basics to rally and play points. Get on court and play lots of matches whilst learning tactics to help improve your gameplay! Fun group session to help players develop technically and tactically still enjoying the game. Fun group session to help players develop technically and tactically still enjoying the game..
For more information on any of our junior coaching, or a free taster session please contact us. Are you a member of the LTA? All players in the squads should be members of the LTA – it’s free to join too. If you haven’t got LTA membership, please contact us. Fun group session on smaller courts with softer balls where the basics of the game are taught. Using a smaller court. Fun group session on 3/4 length courts aimed at teaching the basics required to rally and play points. As a Mini-Tennis Accredited Club, all of our term-time development sessions are run to LTA guidelines. These are not drop-in, but groups according to age/ability. A session for better Red ball players to focus on rallying and gameplay. A session for younger players just starting out focusing on co-ordination and basic technique. A session aimed at teaching the skills to be able to rally and play points on a 3/4 lengh court. A session aimed at teaching the skills to be able to rally and play points on a full court. A session for players to work on technical and tactical skills. A session for players to look at improving their skills through drills and match play. A Tots tennis group which is aimed at children aged 3-5 years which teaches key hand-eye co-ordination skills and whole-body movements that will help them progress through to Mini Tennis and beyond. Tennis Tots is all about FUN! Designed to get 3-5 year olds active and learning new skills in an exciting and social environment. High intensity group coaching sessions for select players. A high intensity group coaching session for select players. Saturday morning fitness sessions available in a package with Tuesday Orange / Green Performance sessions. Details of next event coming soon…. This event will provide a whole range of fun activities, all females welcome from 4 to 74 years! It’s designed as a fun and relaxed introduction to tennis for females. Bring a friend, mum, daughter, sister, aunt, or even grandma as age is no barrier. The event is free and equipment will be provided plus a goodie bag for all participants. What do you need: Active wear and trainers. The event will run in all weather conditions with an alternative indoor programme if necessary.